In the late 19th Century, ‘affichomania’ was gripping Paris’ large billboards. The material opulence of the Belle Époque and the advancement of printing technology encouraged brands to advertise their products with striking, colorful visuals, and many reached out to talented artists like Jules Chéret, Henri de Toulouse-Lautrec, and Pierre Bonnard to illustrate their messages. Corporate advertising began to be discussed in newspapers, appreciated as works of art, and the designers fêted as artists of a new era. By the mid-1890s, Art Nouveau was making its impact on this ‘Art of the Street’ under the leadership of Alphonse Mucha, who, in 1895, caused quite a stir with a poster advertising a new play with Sarah Bernhardt. The following year the Czech artist signed on exclusively with the Parisian company F. Champenois Imprimeur-Editeur to illustrate advertisements of a broad range of subjects, from railway services to consumer products such as confectionary, perfume, and champagne. One of these first consumer goods posters was for Champagne Ruinart, for which he used the image of a beautiful woman with long flowing hair to send an enthralling message about the product she was representing. In 2006, more than a century later, Ruinart restarted its collaboration with the art and design world when it asked interior architect and designer India Mahdavi to design an elegant champagne spoon, a tongue-in-cheek interpretation of the utopian task of the little silver spoon that is supposed to prolong the life of champagne bubbles in an opened bottle. Four years later, the champagne house renewed the collaboration with a presentation box for a bottle of Ruinart Rosé. Here Mahdavi drew inspiration from the history of champagne, when in the 18th-century bottles were first transported in baskets full of straw or long narrow strips of paper, and created “Extraits, Volume I,” a delicate white presentation box housing, along with the bottle and glasses, a pile of ribbons in cream, pink, and gold tones, all printed with poetic text by Verlaine and Apollinaire. Collaborations with other designers have yielded a champagne stopper in the form of a Chardonnay flower by Christian Biecher and another in the form of a wire cage by Patricia Urquiola, a bento-like gift box by Japanese studio Nendo, and a leaning champagne bucket by Maarten Baas, amongst others. But along with those product-related collaborations, Ruinart has also started to commission stand-alone works of art. 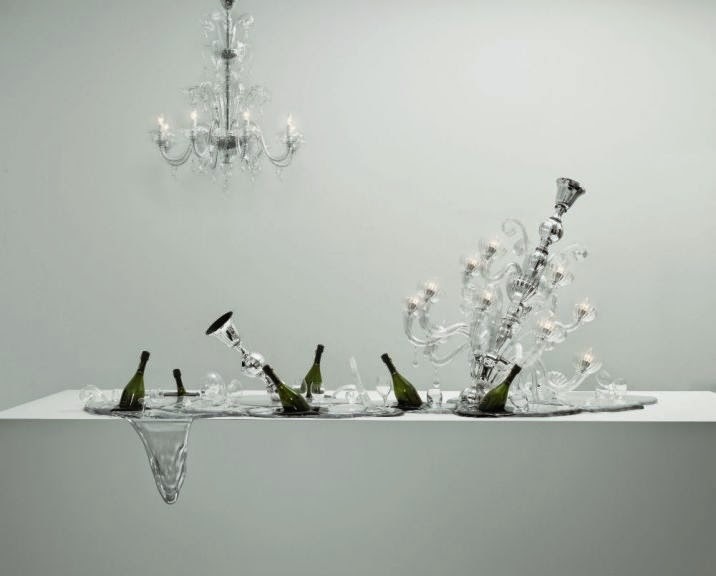 In 2008, Baas created the sumptuously Baroque, Bouquet de Champagne, a massive light sculpture in Murano glass that re-interprets French, 18th Century opulent centrepieces in a Surrealistic manner, with a crystal chandelier collapsed on the table surrounded by “melting” glasses and ice buckets. The association with Baas was a bold one, as the enfant terrible of Dutch design is known for transforming classic furniture design by presenting burnt Victorian armchairs with charred armrests in his unforgettable collection, "Smoke", or playing with accumulative functions in the collection "Hey chair, be a bookshelf!". “Every time, we propose a theme to the artist or we bring him or her to the maison and have them make a proposal. But we’re very much interested in ‘reinvention,’ so for example the reinvention of the case of champagne, or the reinvention of the art of the table, with a beautiful bucket,” Dufour said. The Israeli artist said he was asked if he would be willing to paint the Ruinart "family" on cardboard packaging used for Ruinart bottles. “When they emailed the portraits I was supposed to execute, I preferred, as I usually do, not to read the titles and keep them anonymous, only later when the work was done I discovered who these people actually were. What attracted me most in this whole project was that they asked me to do what I usually do, and left me to my own devices to interpret their history with their own material logo, packaging, etc,” Rubin added. Dufour said collaborations with artists and designers are often based on chance meetings. “We are looking for artists whose works best embody our champagne’s style. So something light, with a certain elegance and refinement,” he said. This year, Ruinart is showcasing one of the maison’s latest work at the various Art Basel fairs: a stunning paper sculpture by the young, fast-rising Scottish artist Georgia Russell, who used her scalpel to make a work cut out from a reproduction of the champagne house’s first ledger, creating an explosive sculpture of shredded paper that gives new life to the history of the house. “We now support about 27 art fairs in the world. At those fairs, we meet a lot of artists,” Dufour noted, adding “we’re not really interested in working with big names because it’s not about showing off. We prefer to work with lesser known artists that are recognized in the art world, even though their names may not resonate with a general public. “What is important for us is to work with an artist who is true to art the same way that we are true to champagne. Because we’re all about authenticity,” he concluded.